A vibrant Rapper Costume including Jacket, Trousers and Hat, ideal for Movie/Music/Icon fancy dress occasions! Turn heads with this fun Rapper Costume, including Jacket, Trousers and Hat. This outfit is perfect for any Music/Decade/Film or Icon fancy dress themes. The yellow jacket has a wet-look to it making it stand. The jacket has a hood and elasticated bottom, with a black stripe down the middle and on both arms. A pair of matching yellow trousers are also included - these are in the style of a tracksuit bottom as they are baggy and have elasticated ankles. The finishing touch to this great Rapper Costume is the beanie style hat with black trim, the best costume for any wannabe rapper! 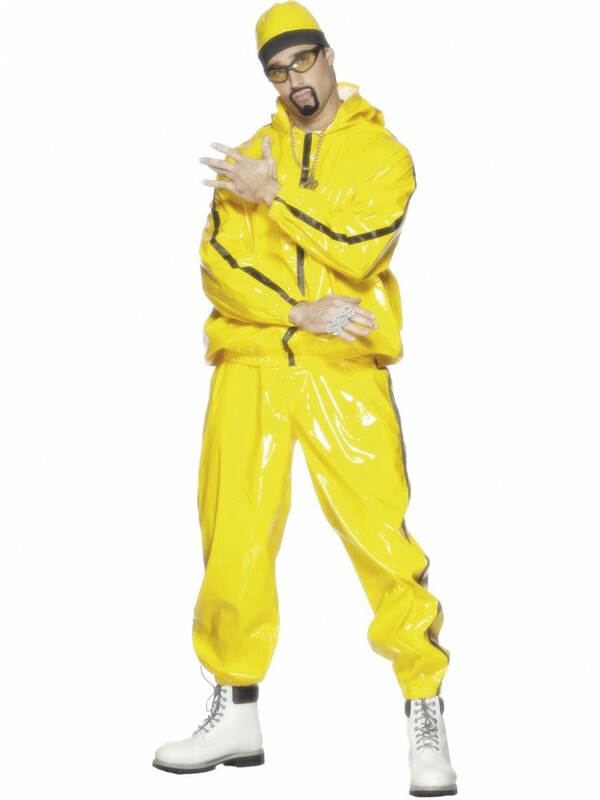 A brilliant Rapper Costume, ideal for Music, Icon or Movie themed fancy dress! Rapper Costume including Jacket, Trousers and Hat.